Waitress And The Artiest. 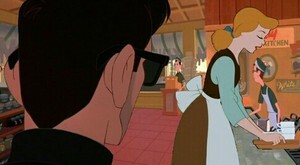 ( From "Born To Die" Disney Crossover Video On YouTube) Cinderella makes a simple life for herself as a waitress and met a beatnik artist name Dean Mccoppin, and she thought his encounter finally allow her to find the love she's always wanted?. Wallpaper and background images in the disney crossover club tagged: photo cinderella dean the iron giant. Thank you, Same to me but i use her in many crossover but than something hit me.